I have many important things to tell you. 1. I’m doing a podcast! I intended to tell you about this a week ago, but there’s been an illness in my family, and I’ve been away, and it hasn’t been a lot of fun, so, you know, let’s talk about that podcast. It’s called Spilled Milk, and I co-host it with my friend Matthew Amster-Burton. Every time we record an episode, Matthew makes me laugh until I snort, cry, hyperventilate, and/or hoot like an owl, and I hope our show does the same for you. The first episode is on the topic of fried eggs, and you can listen or download it – free! – through the Spilled Milk website, or through iTunes. The second episode, on winter squash, will be released a week from today, on January 21. 2. Yes! That’s a new banner up there! It had been the same for three years, and those orangettes were stale. So, in honor of winter, I give you a head of cabbage instead. When spring comes, we can switch to artichokes, I’m thinking, or asparagus. Maybe rhubarb. It’s going to be exciting. 3. I love this chocolate mousse. Loved it, rather. I seem to have a nasty habit of writing about rich foods in January, right on the heels of the holidays. I’m sorry about that. Even I don’t want to hear about chocolate mousse right now. But I love this recipe, so I’m going to write about it anyway, and even if you are totally chocolated-out, or desserted-out, or avoiding sweets as a New Year’s resolution, or whatever, I strongly recommend that you bookmark it for future use. It’s my go-to chocolate mousse. I think everyone should have a go-to chocolate mousse. It’s not hip, nor has it been for about a million years, but it never goes out of style, either. It’s the Audrey Hepburn of desserts. Only fatter. Or fattier? You know what I mean. I can’t remember how or where I was introduced to chocolate mousse, but I remember eating an alarming amount of it when my parents took me to Paris as a kid. There was a restaurant called Claude Sainlouis, I think, around the corner from our hotel, and though we were only in town for ten days, we went there twice, mainly because I was obsessed with their chocolate mousse. The first night, the host sat us in the back dining room, hidden behind a partition. The main dining room bustled, but ours was empty, quiet as a church. I remember my parents saying that we’d been put there because we were foreigners: we’d been sniffed out, ghettoized, hurried away from the French-speaking diners. It was a terrible feeling. I’m not sure why we went back, but I must have begged convincingly for the mousse, because we did. And the second night, miracle of miracles, the host smiled at us, a tiny smile of recognition. He showed us to a table in the main dining room. My father beamed. It was a great night. I ate steak frites and mousse au chocolat. I don’t know that the mousse was anything special, but I loved it. I was 10 years old, and my feelings about chocolate mousse were much like my feelings about ice cream: good or bad, it was AWESOME. The restaurant is still there, I think, although I haven’t been back. I looked it up on Google Street View, and the awning looks much classier than I remember. Who knows. The thing about this mousse recipe, to put it simply, is that it’s perfect. Some mousses are dense and sticky, like a ganache truffle. Others are foamy, almost frothy, with the mouthfeel of a marshmallow. This one sits squarely, happily, in the middle. It’s soft and creamy, light but substantial. It’s also not too sweet. It’s deep and dark and complex, spiked with enough coffee and booze to complement the chocolate, but not compete with it. As I recently heard Brandon’s aunt say of her son’s new girlfriend, I think it’s The One. It’s a keeper. Just a single caution: see this teacup? 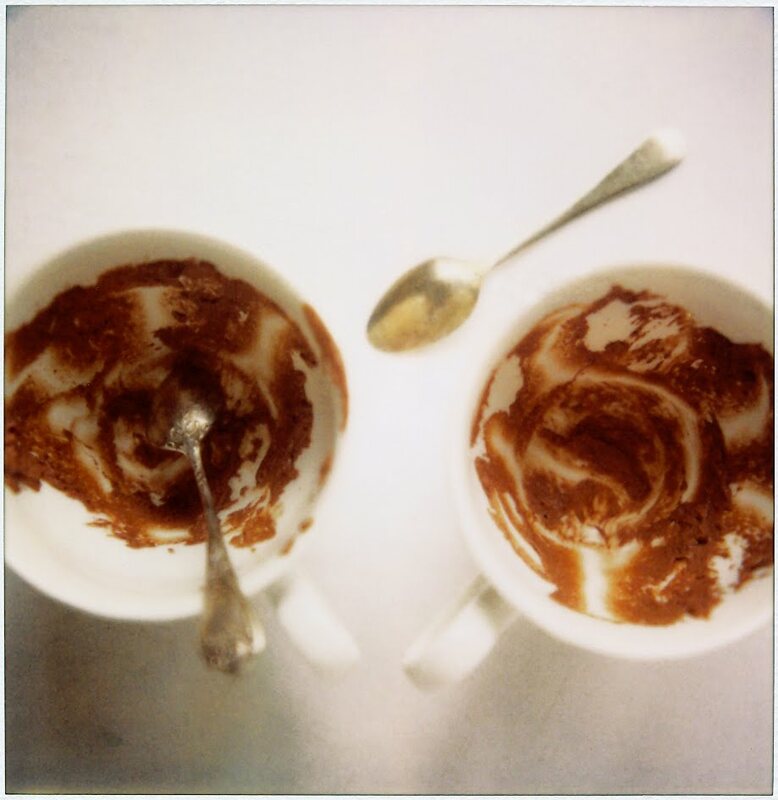 It’s a standard size, as teacups go, but people, that was a LOT of mousse. Do not fill your teacups like I filled my teacups. Do not. The amount of whipped cream on top, however, was spot-on. The original recipe calls for brandy, not whiskey, but I never seem to have brandy around. We’re whiskey people. You can use whichever you want. About the chocolate: the good people at Cook’s Illustrated use Ghirardelli bittersweet (60% cacao) chocolate for this recipe, and I do too. You could use a fancier brand, if you want, but whatever you use, it should contain about 60% cacao. Chocolates with a higher cacao percentage have less sugar and a starchier consistency, and they won’t work well in this recipe. Also, about serving size: chocolate mousse is, by definition, serious stuff. I am pretty much a total pig about dessert, but I recommend that you offer this in small servings. The recipe makes six to eight servings, and I lean in favor of eight. Especially since I like to serve it with a whack of whipped cream on top. Combine the chocolate, cocoa powder, espresso powder, water, and whiskey in a medium heatproof bowl. Place over a saucepan filled with 1 inch of gently simmering water, and stir frequently until the chocolate is melted and the mixture is smooth. Remove from the heat. In another medium bowl, combine the egg yolks, 1 ½ teaspoons sugar, and salt. Whisk until the mixture lightens to a pale yellow color and thickens slightly, about 30 seconds. Pour the melted chocolate mixture into the egg mixture, and whisk until combined. Set aside for about 5 minutes, until just warmer than room temperature. In the bowl of a stand mixer fitted with the whisk attachment, beat the egg whites on medium-low speed until frothy. Add the remaining 1 ½ teaspoons sugar, increase the mixer speed to medium-high, and beat until soft peaks form when the whisk is lifted. Detach the whisk and bowl from the mixer, and whisk the last few strokes by hand, making sure to scrape up any unbeaten whites from the bottom of the bowl. Using the whisk, stir about ¼ of the beaten egg whites into the chocolate mixture, to lighten it. Then, using a rubber spatula, gently fold in the remaining egg whites until only a few white streaks remain. In the now-empty mixer bowl, whip the heavy cream at medium speed until it begins to thicken. Increase the speed to high, and whip until soft peaks form when the whisk is lifted. Using a rubber spatula, fold the whipped cream into the mousse until no white streaks remain. Spoon into 6 to 8 individual serving dishes – I like to use teacups – or, if you’re feeling casual, mound it up in a single serving bowl. Cover with plastic wrap, and refrigerate until firm, at least 2 hours and up to 24 hours. For best texture, let the mousse sit at room temperature for 10 minutes before serving. Serve with very lightly sweetened whipped cream. I love,love chocolate mousse, so thank you. Glad to have you back!! Molly! You're back. Welcome back. I am a heathen and like neither coffee nor booze (I KNOW). Would this work without them? Verification word: demicize. Sounds like what you should do with serving size for this recipe, y/n? Ooo, exciting! I'm heading over to listen right now! Whipped cream helps cut through the richness! let alone from the fact that your chocolate mousse recipe sounds divine, i have to say that i was sitting here this morning, alone in my j.crew romper pjs, laughing out loud over your podcast. hilarious stuff…though insightful at the same time. next thursday could not come soon enough! let it be known: spilled milk podcast was bookmarked. say no to jiggly and gelatinous and hello to fried eggs on braised anything. Great to have you back Molly. you're right; everyone should have a go-to chocolate mousse. this one sounds so good because of the added coffee and liquor. do you think you could replace it with a brandy or rum? I think bitterly cold January days are a perfect time for rich, indulgent recipes. Keep 'em coming!! ¡hola! will listen to the podcast later on as I have to run now. can't wait. just one thing though, not sure it was done on purpose to try and catch us napping but the book titles on the 'about' bit do not match your identities. YUM! I'll have to try this. Can't wait to check out the podcast too. Hope your family member is on the road to recovery. VERY cute podcast. You & Matthew both sound like you're having fun; can't wait to hear the next one. And yum on the CI chocolate mousse. Thank you for entertaining me while Sleepless Near Seattle! I made my first chocolate mousse this past week and it was incredible. I am so addicted. I am not ambivalent about chocolate mousse – but I am picky. I too don't like sticky, sticky mousse so I can't eat Julia's, My FAVORITE is the mousse that Rebecca Charles makes at Pearl Oyster Bar. It is oh, so chocolately but also silky and smooth. Just perfect. I will be trying yours this weekend. Wow. Chocolate mousse is not as intimidating as I had imagined. That's pretty good news. Do you think the recipe could be cut in half without any major structural problems? Love the new header! I just finished your book and totally loved it. I have a gaggle of girlfriends dying to borrow it now that I am done. Glad to see a new post – you are missed when you are gone! I've made chocolate mousse in the past from my Portuguese cookbook. Here in Portugal they like it like ganache and densely thick! I gave myself a sugar/chocolate induced comma from eating so much of the stuff! But i have been begged to repeat it, so i will do, now with your gorgeous sounding recipe! I ate way too much chocolate at Christmas, but who cares.. carry it on!! YUM. I think I just stopped caring about my New Years resolutions. Also, love the cabbage! Sounds delicious! I'm always looking for ways to use whiskey in cooking. Oh, I love that lemon cream. I need to make some soon; it's delicious stuff. I'm very pleased by the contrast between cabbage and chocolate mousse on your site, right now. oh goodness this sounds delicious. i have never really had mousse before but i think ill give it a go 🙂 love the new header!! I would just like to say that I am never in a state of not wanting chocolate. And, I love the new banner, Molly! Three cheers for cabbage! Hi Molly, I feel this time of year while some folks may wish to abstain from excess I just want easy recipes that will deliver. Between all the cooking for the holidays and the grey sky I need the ease and comfort of that. This fits the bill. I also wanted to let you know I have a blog that I would love you to check out. It is called Hippo Flambe in honor of the meal I threaten my children with. I feel a little funny clogging up your comments with the url but is says to in your FAQ. i like you. have i said that recently? This looks terrific. Thank you for sharing it. And best wishes to your family (I saw you mentioned an illness). Molly, I just read your book after receiving it for Christmas and LOVED it. I couldn't put it down. It was so wonderful to read your passion for food and family, and how the two are so interconnected. Thank you for sharing your stories in such a poignant way. And, BTW, I made your sister's famous scones. I added raspberries to my batch, and of course, was careful not to knead them more than twelve times. They were absolutely delicious. Perfection. Thank you! So happy to see you back! Hope all is well with your family. Looking forward to the podcast. Take care. Congrats on the podcast! I listed to it this morning on my very early dog walk and it was fun. I look forward to the next segment. I triple love chocolate mousse and also made it this year for annual holiday party – but I didn't serve it in teacups, and I'm definitely going to do that next time…great idea! I love your new banner and the podcast, very smart. I get pretty darn excited about eggs, too. we don't have brandy or whiskey around here, but we do have some amaretto & a bottle of grand marnier tucked away, somewhere…any thoughts as to whether those would help or harm as substitutions? btw — the green leafy photo is lovely, particularly when viewing it from the frozen north! Just listened to your first podcast on my headphones while at work. You were not kidding about Matthew; he is so funny. And I hadn't read him before, so I have a new googling project before me. I was grinning at my computer screen and my co-workers were treated to bursts of inexplicable snorting throughout. Great show, I loved listening even though I don't eat eggs. Looking forward to more of the same next week. 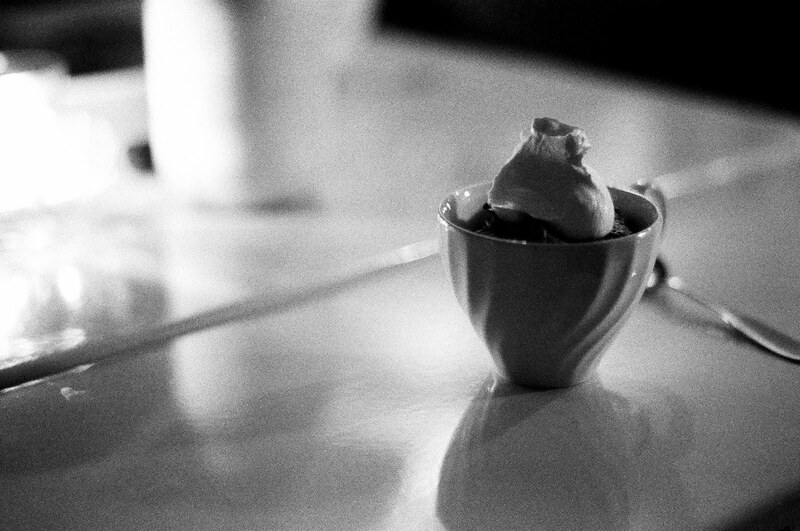 Espresso cups work really well for manageable chocolate mousse portions. I got a set as a gift a few years ago – they've never once held espresso, but they've seen more than one variation on mousse. At the age of 10, I'm sure I didn't even have an inkling that ice cream could be bad. It was ice cream! By definition, perfect. Oh, Molly, it's summer Down Under, and after all the excesses of Christmas (alright, let's be realistic – the excesses which started about a month before Christmas! ), you may actually SEE a serving of chocolate mousse sticking out of my thighs when I go to the beach! Not good. I would not call that a nasty habit, just a very necessary strategy for combating winter blues! I enjoyed the first podcast and look forward to the next. Congratulations on your new podcast! I can't wait to listen. For a fabulous artichoke banner, check out this fun new food blog (i.e. mine) at http://www.umamis.blogspot.com. I was thrilled to find your podcast the other day and love the new header. I'm bookmarking this mousse for Valentine's Day, it's not that far off. This sounds absolutely amazing. I'm going to try it as soon as I lose those pesky 5 pounds! thanks Molly! January is kind of the worst month because it's dark and cold and perfect for holing up in a warmly lit house with the stove and oven going for hours at a time… but it's also steeped in post-holiday guilt and attempts to change. but really, resolution rules aside, it's just about all i can do to make it through the month at all. how to cope? chocolate mousse will do just fine. i like your style. You're right–chocolate mousse has been out of style for about 20 years, but it's never gone out of style with me. When I was in grade school, I requested chocolate mousse for my birthday party. My mom, thinking all these little girls wouldn't know the difference, made instant chocolate pudding instead. I'll never forget finding that (very uncharacteristic) box in the kitchen and the ensuing sense of betrayal. Your delicious recipe might finally rectify things. Oh, YUM. I'll have to try this. And I think probably any chocolate mousse in Paris is divine. Or seems so the first time you try it. Ooooh, I was so excited to see a new post! I'm a late-comer to your blog but I'm hooked and I cannot wait to get home to download your new podcast… How exciting! To me, no matter the era, there is always room for chocolate mousse. This recipe sounds fantastic and I know it will quickly go on my list for the coming weeks. I just finished your book last week and I had a very Molly-filled weekend trying several recipes from it while my husband was out of town (although don't worry, he reaped the rewards of leftovers!). I made the Chana Masala (is it embarrassing that we finished the whole thing in less than three days?! ), your fennel and asian pear salad (amazingly delicious and simple), the roasted eggplant ratatouille (it was almost more fun making it than eating it! ), and, of course, your wedding cake (which I could devour on my own, but I was good and set aside several pieces for friends). What a wonderful weekend! Thank you for your book – it warmed my heart from first page to last. And I have little sticky notes just littered throughout it, begging for my attention. It's the most fun I've had in a long time! I will be trying your sweet potato cake, yogurt cake with lemon, and chocolate chip cookies this weekend to take to a Golden Globes watching party. Aren't my friends lucky?! I have to try this recipe, if for no other reason than it's from Cook's Illustrated, the source for all recipes perfect. I love your podcast! And to risk sounding really, really, weird, your voice sounds just like I've always thought it would while reading your writing. That is supposed to be a compliment, in some way. Great new banner, too! Chocolate mousse is one of those magical dishes–almost like culinary alchemy. Can't wait to try yours. Oh Molly…welcome back and Happy New Year to you and Brandon…and Jack! I have to say the new dessert at Delancey..Meyers Lemon Pudding was AMAZING!!! Best thing we HAVE EVER tasted as far as desserts go! YUM…Brandi is a keeper! This sounds amazing and I want some right now! Wonderful recipe! I am so inspired by it. Wondering why on your spilled milk blog (about page). Is your book listed as Matthew's and Matthew's listed as yours? Read both and think they're wonderful! Have you tried Ina Garten's from her book on Paris?? My mother gave me the book 3 years ago and after oggling it for all that time I finally broke down and started making recipes from it… which got me into trouble when I made the mousse- with grand marnier! It made waaay too much but I ate almost all of it (I triend to share, I promise!). I highly recommend it!! My boyfriend and I made chocolate mousse for his parents anniversary. It was the first time I had attempted mousse and it was pretty perfect. Recipe out of the Joy of Cooking. Additionally, my sweetie had the idea to put the mousse in an espresso cup and top with whipped cream and a sprinkle of cocoa. It was a hit and also the perfect serving size. I've been meaning to try making chocolate mousse, so thanks for sharing a delicious-looking recipe. Chocolate mousse is one of my all-time favorite desserts; there's a great French-style restaurant in an old library on Market Street in Ballard/Seattle, and whenever I go, I seem to end up ordering the mousse, even though I don't normally order dessert! Molly–This is my first ever comment on your blog! I learned about orangette earlier this year but didn't start really reading until about a month and a half ago. And lets just say that I read it rather obsessively until I was caught up. I even (please don't think I am totally creepy) wrote a little shout out to you on my blog! I got your book as an anniversary gift from my husband (year one is paper so they say) and I have listend to the podcast as well. So I am a full on fan! I look forward to more comments in the future! I love the bright new banner! I thrilled to start downloading your podcasts! I love hearing about food in the middle of the night when I can't sleep!! BTW, thank you for your tips on setting up my recipe index, many months ago, your suggestion is working beautifully. I loved the podcast! I'm officially a Spilled Milk groupie! This chocolate mousse sounds delish – question, if I'm not a whiskey or brandy fan, what else would you suggest to substitute? Grand Marnier? PS – Loved the reference to Audrey Hepburn. She's one of my favs. yes please! To everything and both. Interested to read the recommendation to use no higher than 60% cocoa chocolate . THAT'S why my last mousse , usually fine , was heavy .Delicious but more like a truffle . Thankyou ! Next time I'll try yours . Sending you thoughts of happiness and cream braised sprouts. I hope your family member is on the mend-i know all too well how stressful it can be. i have been thinking about mousse more than any sane person should lately. in fact, i sometimes spell my dog's name “mousse” instead of “moose” (as it should be). will be trying this toute de suite. Welcome back! I think the new banner is great–such beautiful texture cabbages have! Of course the orangettes were highly appropriate, but it's also appropriate to bring in something new & fresh & green with the new year. I love that about food. You can take on bite of something and it takes you back in time. Who knows if you would have remembered that story if it wasn't for the mousse? Wow, I love that gorgeous black-and-white photograph! Stunning! Wishing everyone a fabulous 2010…I think it's going to be a good one. Congrats on the podcast! Can't wait to hear it. That is by far the most “un-nasty” habit you can have! While some are on their carrot kick for the new year, I like your diet a whole lot better! Thrilled to see an Orangette recipe and a post from you, at long last. It's too much to have Gourmet defunct and Ms. Orangette too busy to write. I've been in a deep foodless funk. I love chocolate mousse no matter what time of year…actually a nice cold winter night, even January, seems like the perfect time for it. I wonder if I could do it for a dinner party I'm hosting next week? To scones4all, teryll, deborah, and any others who don't have or want to use brandy or whiskey, I'm guessing that Grand Marnier would be lovely here. Rum might also work, although I'm having trouble imagining the flavor. And I'm not an amaretto fan, but if you are, it's worth a try too. Elizabeth B, yes, you could certainly leave out the coffee and booze. They help to boost and deepen the chocolate flavor, so without them, the flavor might not be as intense, but it should be fine. (I think!) You can leave out the coffee entirely, but for the booze, you should replace it with an equal amount of water, to keep the total amount of liquid in the recipe the same. Let me know how it is! Adrienne, I haven't tried cutting this recipe in half, but I can't imagine why it wouldn't work. You might have to beat the egg white by hand, since one egg is too little for a stand mixer, but otherwise, I think it should be just fine. I am so so happy you are writing again. I came late to orangette but quickly became obsessed with your writing via your book. I will fave this in google and come back someday. not this month, but i may be able to justify it next month for the heart day meal. The podcast…hilarious! I don't know if I will ever eat a fried egg the same way again!! Can't wait for more…more blogging and podcasts that is. I am uploading podcasts over the weekend and will add yours – thanks! I am sure you have no time to watch t.v., but on Bravo they have a show called Chef Academy with Chef Novelli and he made the most amazing thing called chocolate pot. Being diabetic, I don't eat many sweets, but let me tell you, this was insulin worthy! the best part was that it wasn't overly sweet – the perfect combination – and the fresh whipped cream didn't hurt either! Hope you have a busy weekend at the restaurant! How am I possibly going to avoid dipping into these during the 2-24 hour firming-up period? Sigh. And then try to sprinkle a little ´poudre de caramel au beurre salé´)bought @ G. Detou in Paris) on top of the cream…. (or caramal sauce and spinkle a tiny bit of salt)…makes it even more heavenly then it is already!!! love the mousse (working on a dairy free version now) and the podcast! Chocolate mousse was my absolute favourite dessert when I was growing up – it possibly still is – and this has just reminded me to make some very very soon. Great to have you back – loved the podcast, it really cheered up my bus journey to work. Love the new banner. And I appreciate that your food photos are often a little out of the ordinary – empty cups, etc. Thanks! I heard the podcast almost a second after it came out….and although I could not eat a fried egg (long story there) I LOVD the podcast! it was FUN! Can't wait for the next. I look at you blog every day hoping another one will appear. You are just great, Molly! Looks delicious! I have a mousse recipe from a CIA cooking class that is a great basic, but I've never gotten around to kicking it up with coffee or booze. Sadly, with two very little ones who love chocolate, I think I won't be able to try to whiskey for a few years (to my husband's disappointment). I often use martini glasses for mousses and granitas – we got about 100 as wedding presents and this is about the only use they get these days! Just so you know…you were missed by many, even though we know how crazy busy you are, your voice is a happy one to hear/read on a more regular basis. And you've come back with a bang!!! Nothing like chocolate to wow your friends and fmaily. So excited for the podcast! Chocolate mousse is one of those desserts that my husband constantly try and find an excuse to make. Bad day? Mousse! Great day? Mousse! I think it's perfect for pretty much any occasion. Thanks for the recipe. Thank you for this recipe! I was so glad to see this version: no butter (how did butter ever get into mousse anyway), very little added sugar and a normal amount of eggs. I made it this afternoon. I did a half recipe as written. The half recipe made exactly 6 servings (in 3 ounce ramekins). I did whip the egg whites and whipping cream by hand as the amount is small. I was planning to use some good quality semi-sweet chips but amazingly there was a bar of Valrohna 60% in the fridge. We are brandy people at this house so I used 1 T. of Martell cognac. It's just the right amount chocolate versus sweet and not too rich. The texture is great. However, the espresso powder and powdered cocoa are not a good addition, imo. I was suspicious of powders when I read the recipe but believed the good people at Cook's Ilustrated were trying to get reliable, consistent flavoring into the recipe. I see no benefit to the cocoa and would use freshly brewed espresso next time (5 teaspoons). Or none and just use water. I used to flavor choc. mousse with Grand Marnier back in the 80's. If you like that flavor I'd use only 1 tablespoon and make up the rest with water. You could also skip alcohol and use a few teaspoons of quality vanilla. It's a really good, non fussy recipe. Enjoy. Love your book and your blog! This mousse sounds divine. Love chocolate mousse, and love the cabbage (but loved the orangettes too). Sounds like such fun on the horizon. Looking forward to as much writing as you can squeeze in! And the podcast is great. Mmm, I look forward to trying this recipe. I started your book a few days ago and don't want it to end. You remind me so much of myself in that many of my memories evolve around food, and thus I have lots of food related stories. I was inspired yesterday and made the Couer a la creme with raspberry puree and it was AMAZING! And so simple to make, and our dinner guests loved it too. oh. my word. (i have similar childhood memories of chocolate mousse – a decadent treat when we ate out as a child.) now i'll be looking for an excuse to make chocolate mousse this week. 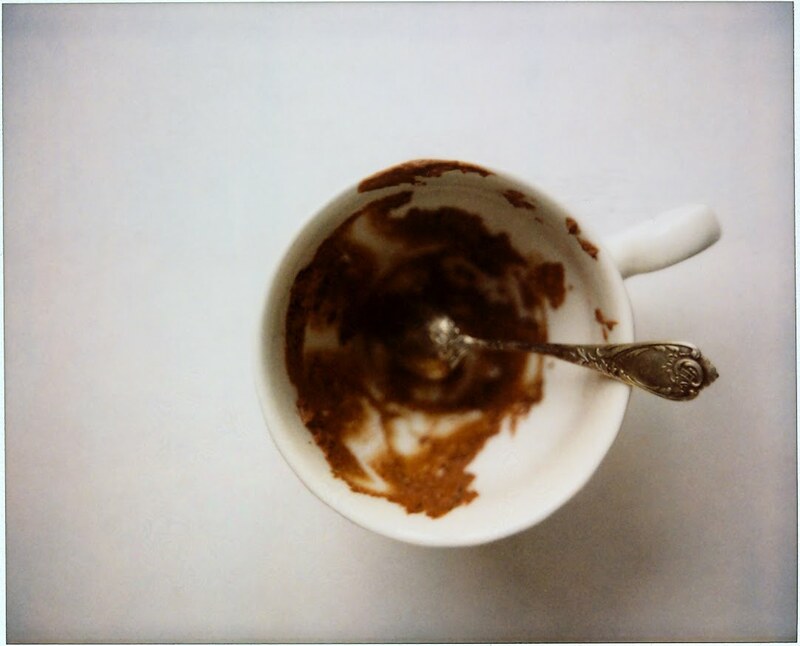 Can I just say these photos of a tea cup without out chocolate mousse in it makes me want to make the mousse so bad I can hardly handle it? Thank you for this recipe, I needed a chocolate mousse. And since I tried the winter whiskey cake, I now have complete trust in your chocolate sharing. ps. I love the cabbage. My first mouse was at a local restaurant called “Aunt Maude's”. It was the place you went for dinner before winter formal and prom. So delicious! They make an amazing chocolate mousse. I don't know if it has bourbon in it. I think it might have a touch of espresso powder. Le Claude Sainlouis has a website and it looks to be the same owner I bet. I will try to get there next time.. Thank you for new inspiration. The black and white photo is divine… refreshing to see. So glad to see you back, sanity still intact. Accidental rhyme. Missed your blogs. This is going to sound stupid, but when I listened to the podcast I was kind of surprised to hear your American accent. Of course, I am aware that you are American, but I guess I'm just so used to reading you in my own voice! I love chocolate mousse too. It was one of the first things I ever learned to make alongside gingerbread men and bread rolls in the shape of hedgehogs. I made the mousse last night and just ate a cup for breakfast. Wow! It's soooo good. I'm sad that I've got 5 more servings and only until tonight to eat it all. Ha! BTW, I didn't have any alcohol on hand so I used a teaspoon of vanilla and made up for the rest with water. Just added it to my RSS. Nice to hear from you. Love the podcast! I rarely order dessert when we go out, but if I do, it's probably chocolate mousse. I'm definitely going to give this recipe a try. Also, I'll be in Seattle for 1 night in March. Guess where I'm insisting we eat dinner? super excited about your pod casts molly. what a brilliant idea. also whole heartedly agree with you about chocolate mousse. I blogged about it a few weeks ago, although mine is a minimalist version with just chocolate and cream so there's no need to worry about the raw egg thing. Glad tosee you're back but I hope your family illness is better. The mousse sounds divine. Empty cups what a yummy tease. hope all's well now, molly. heading to spilled milk next – matthew is HILARIOUS!! omg! YAY!!! thanks for the recipe – YUM!! I found this blog last month after my CSA box came with chard, chard and more chard. The zuni panade has been such a hit, that I've brought the entire thing to work to share. Today, when searching for something to do with kale… I saw the mousse. The podcast is downloading, the egg is frying, and the mousse is setting. I don't think there's anything wrong with rich food in January, but I'll say that it is rather difficult to read any of your posts and not head straight to the supermarket! Love chocolate mousse even though it can be a bit rich, so eating a teacupful would probably be the end of me. Just heading off to listen to the podcast. That mousse looks divine! Definitely going to have to try it! Thanks for posting! so excited for the podcasts. and chocolate! I made this for a dinner party last night and it was PERFECT. I portioned it into 6 servings and it was too much. I should have followed your advice and gone for 8. Thank you! Molly,this is my first ever visit here and im so so so inlove-with u and ur site…. (ok i do fall in love 24*7 with love,life and yeah food…).and ur love stori is jus so so so romantic…..
Just read ur 'about'page and its so so sweet and overwhelming…u know what i think ur jus an amazinglyy wonderful gurl and deserve this so so muc…. DIdn intend this to look or sound like an email and am sorry if it does but i do have this heart that goes with the flow…..
And ofcourse this chocolatey mousse….rocks……. Molly, a long time reader here just letting you know that I finished your book over the weekend, loved every page, and have already whipped up some Banana Bread with Chocolate and Crystallized Ginger, which I am polishing off as we speak (type?). Well done! the last time i was privy to chocolate mousse was in paris…and it was communal chocolate mousse, no less – served up in a GIGANTIC bowl. i nearly fell off my chair. Made your mousse last night and served it to 5 friends. they gobbled it up so fast that i knew this was a recipe to hold on to – thanks! mousse! so divine. i think this is overlooked on menus these days….i hope that changes shortly. this looks delicious. glad to see you back. also, podcasts=glorious. I love your desription of the mousse. Mucho talento! I've always been a huge fan of chocolate mousse. I can't wait to make it. My daughter will love it! I also love chocolate mousse! It is what I always order for dessert and if there is none, I find something chocolatey! I went to balthazar this weekend because of your blog! It was a teeny tiny fleeting moment of wonder, because they move you through so fast, but it was good. MMMM almond croissant. Je t'aime. my 1st time visiting…lookin' great so far! i have been a lover of your blog for quite some time and am sooooo glad to have you back! i bought your book for christmas and had it shipped ( alllllll the way to australia) and it is wonderful! the chocolate mousse is also going down a treat with my housemate as were lazing away our summer holidays–i've already made it twice this week! mmmmmmm, that is a very tasty chocolate mousse! The teacup photo looks as if it could have been taken in an old French cafe- beautiful! I'm excited to make this soon. Congratulations on the podcast! You are making me break my new years resolution…lol…this looks like something I can try myself so you are keeping up my hopes here…looks really yummy…I will definitely try to make this. 3rd: even after completing culinary school, inspiration to fry an egg was exactly what i needed right now. Do you think the chocolate mousse recipe could be made with splenda instead of sugar? I'm watching carbs and the remaining ingredients are acceptable on the diet, just not sugar. I love the idea of the podcast. Great techno touch and very practical (my wife and I connected the laptop in the kitchen and were listening to you while cooking). Really a fun experience. On a trip to Barnes and Noble yesterday I stumbled upon your book! I love it! I blogged about it! I probably told everyone I knew about it! Call it a little Julia and Julia, I plan on making all the recipes as I come upon them in the book! Super inspiring! Now I have to catch up on what I have missed and curl up with your book! Love your story about your family's experience in Paris. Can't wait to try the mousse recipe. This recipe sounds so delicious! I've been looking for a recipe such as this to try. Thanks! Frankly, there is no better time than January for Chocolate Mousse. The mousse seems absolutely delightful. Yum, chocolate mousse is so classic. Good luck on the podcast, the first episode was great. Hilarious! I am on a post Xmas diet now, but as soon as that is over I am making your mousse as it is one of my fave puds (although I rarely make it as I am matrimonially connected to a completely wonderful person who for some inexplicably odd reason doesn't like chocolate). I sounds “killer diller”, as one of my buds of school days used to say! I did make marmalade in the end. I found a recipe in the Guardian that sounded quite convincing and I mixed it with the know how gleaned from your jam post/comments and some hints from the friends with the orange trees. If you should ever want the recipe I would be happy to furnish you with it. As I don't know if you read comments on your page at BA I wanted to write you here about your celeriac article. I loved it and felt you have done a noble thing for the poor hairy nobbly thing. I will certainly try your apple fennel combo specially as I always find cutting things fine quite therapeutic. It is so odd to read your blog/articles in BA, as it has a great frequency of ringing very true, if that makes any sense. Just a quick note to let you know that I'm loving Spilled Milk! It's great to put a voice to the blog (?)! Keep on keepin' on. The mousse looks fantastic and I will try it tomorrow; but I am actually writing to make a request. I am desperately in need of a great yellow or white cake recipe with a chocolate frosting. I have tried a number of your chocolate cake recipes (all divine), but I haven't been able to locate a comparable yellow cake recipe. Is there one out there? Hi Molly! Have just found Orangette, where have I been?!! (I'm a relative new comer to the land of blogs). I love food, cooking and writing, I think I'm really going to enjoy your blog 🙂 Looking forward to your posts. yes! another whiskey girl. Solidarity, sister! Love the sound of this recipe! I also like my mousse to be not like a pudding, but not like a thick cake either. I think this one may do the trick. Anybody substitute Valrhona Guanaja for the Ghirardelli? I've used the former multiple times in my Mousses and I love it. Oh and I'll be going to Paris this summer so I can't wait to visit Claude Sainlouis while there I'll be sure to take some pics and post them…. If you can't find what you're after in one of those, I'm not sure where to look. Actually, wait, maybe Smitten Kitchen? I've been wanting to make mousse for a while now, thanks for pointing me in the direction of a good one. Although I think your tea cup portion is just right for a serving size, I love it! Off topic, but I just read through this month's Sunset magazine and saw that Delancey was selected as one of their best. Congratulations! 11pm and I just had an inexplicable urge to make this, so now there is a bowl of mousse in my fridge. It is delicious and the perfect texture, but I think it might be a bit rich for my taste. I couldn't finish my teacup! my first time making mousse. my first time eating mousse. fabulous flavor and very rich. i needed a little whipped cream with each bite to calm it a bit for me but my husband loved it. i was tentative about the coffee and alcohol, but they blended in lovely. i love your blog and your passion. thanks for your posts and new podcast. orangettes are my very favorite candy ever. i can lead you to them in copenhagen, rome, santa monica and beverly hills. how about a few on the side for this addict. Yoo hoo…get ready for the fireworks…Delancey was highlighted in the March edition of Every Day with Rachael Ray. Congratulations and get ready for LOTS of loving customers! This is awesome chocolate mousse, I've been making it for four or five years and everyone I serve it to adores it. I make the version with Chambord. And have a little glass of Chambord to sip. A few weeks ago on America's Test Kitchen they made a three mousse cake, which also looks awesome and I definitely want to try that. I was greatly entertained and not a little inspired by your podcast. I will look forward to sitting and knitting and listening to more in the future! oh dear that sounds wonderful! claude sanlouis is indeed still there! my boyfriend and i went there this summer on a trip to paris — and it was fantastic. i recommend a return trip! it will not disappoint. Love chocolate mousse I will use some just before I goes to the Gym. Sorry I missed the podcast though! Oh, I had high high hopes for this. My chocolate seized! It happened when I added the chocolate to the egg yolks. Unfortunately, it was pretty much impossible to fold the whipped egg whites into the chocolate mixture and my mousse is full of lumps. Just wanted to post my results in case other makes the recipe — be sure to use room temperature egg yolks and it wouldn't hurt to temper the egg mixture with a little chocolate to be extra safe. Hope everyone else's mousse is smooth, creamy and lump-free. I loved this mousse too! It has the perfect mousse texture. However, I don't think I am a mousse expert, because I also liked the America's Test Kitchen mousse (an older recipe), Ina Garten's Chocolate Orange Mousse, and another mousse recipe, all equally and I could not choose! I did care much more for the original version of this recipe than the chocolate-orange version (with grand marnier), which tasted pretty weak in the orange department compared to Ina's version, IMO. Of course everyone has different taste especially when it comes to chocolate. Also wanted to add that Cook's Illustrated did make a version just for fancy chocolates that contain a higher percentage of cacao than the 60% Ghirardelli bittersweet chocolate that they developed this recipe for. If you are using a boutique chocolate containing 62 to 70% cacao, simply add 2 Tablespoons of sugar to the chocolate-cocoa powder-espresso powder-water mixture, AND use an extra two Tablespoons of water in the same step. (I.e., use 5 Tbsp instead of 3 Tbsp). Also, use 3 large eggs instead of 2 large eggs. Cook's Illustrated calls this recipe Premium Dark Chocolate Mousse on their website, but if you read it, it's just their explanation of how to work with a higher % cacao chocolate, and they explain that they modified the recipe. Those are the three changes they made (sugar, water, eggs).